"That's one of the things that I really liked about it, from the beginning to the end they did it professionally, and like I said, they cleaned everything, like everything. It actually looked brand new after they finished." William: Clean up was excellent, they didn't leave a thing behind. Sandra: Everything was clean, and they took it all away. They put it all in like a trailer thing, and took it all away when they were done. They had one gentleman that was cleaning, that's all he was doing was cleaning. The other one's were on the roof throwing stuff off and that, and he hauled wheel barrels of stuff around cleaning constantly as they threw the old stuff off. The crew was respectful, hardworking, the managers that were there knew what they were doing. Pinnacle has excellent consumer relationships with people, the office was easy to contact, and they were prompt in return of calls and interest. So all in all we say the job was well done, I'm very pleased. They did it quickly, which was good because the roof was leaking, and everything seems to be fine. I want to thank Pinnacle for the work they did, in such a timely manner. Janet: "They answered the phone almost immediately. Pinnacle was here within, I would say a week to look at the situation, and we had it ordered. As soon as it came in, just a couple of weeks, they came and put it on. It was excellent. The gentleman that came were very nice, they explained that was going on, what they were going to do, approximately how long it would take, and just everything about replacing a door that I didn't know (laughing). Fast, they cleaned everything up around here, they didn't leave me a mess, nothing. They were very polite, very nice men. They had to cut for the frame and everything, and they brought the tools and everything out here on the patio, and they took it all with them when they left... I didn't even have to sweep. Well, we expected them to be efficient. The Pinnacle men were very nice, like I said, fast and efficient and had no problems... I don't know what else to say, they were very good, it was a very good job, I would recommend them to anybody." They did a great job showing up every day and getting the job done. It turned out great, both the vinyl siding and solar system. "Pinnacle met my expectations on getting the job done, getting it done quickly, and doing a good job. Everything looked great, I've not had any problem with anything they did. It was all just done very properly, so I was quite happy with it." "We liked the people that we were working with a Pinnacle, we certainly liked the price. The people that came here seemed to be very efficient." "They were very nice and helped get us loans for the project. They definitely went above and beyond." Efficient, quick, good. Pinnacle was there when I needed them, they showed me why they needed it. I think that's important when someone gets something or needs something, they need to know why they need it, and the gentleman that came out looked and took care of everything, let me know why I needed the roof. "They responded very quickly with all of my text messages and phone calls, and were very proactive. 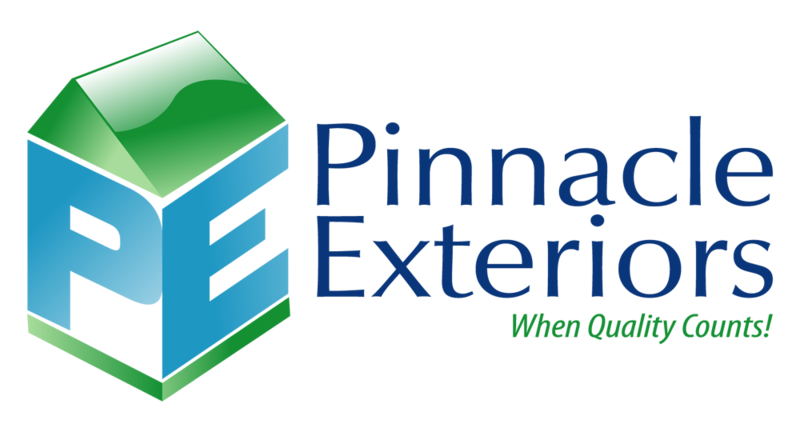 Communication is excellent..."
I was happy with the work that Pinnacle Exteriors did here on my home, there was a little bit of a weather delay but otherwise everything proceeded on schedule in the course of a week. "We searched around for some companies in this area that had good reviews, and we found that Pinnacle had the best reviews of anybody we found. We did price around a little bit and found that your price was very comparable, and your reviews were higher." "Everything was cleaned up real nicely, we just had a new pool put in last year so my wife was a little worried about that, but everything was extremely professional. We did a little inspection afterward and we found there was very little debris left in the yard, everything was cleaned up, and it looked just like it did before you guys came, which was awesome."